Canton, OH (August 10,2018) – Orlando-based Serious Simulations has delivered another industry first at the Pro Football Hall of Fame Enshrinement Week – a unique wireless virtual reality helmet mounted display (VR HMD) for elite football player training. The first unit was created for Colorado-based Sports Virtual Training Systems, an innovative company bringing VR simulation to professional and collegiate football. The first system focuses on training professional football quarterbacks, but can be altered for elite college and professional players in all positions. The custom made, helmet mounted display (HMD) is based on Serious Simulations’ award-winning design known as the PVID Pro, which is a wireless VR display with wide enough field of view to support human peripheral vision. 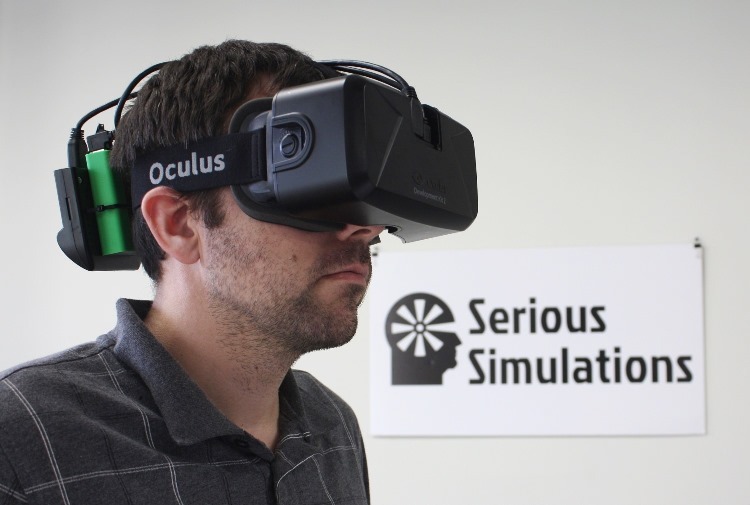 Serious Simulations has two patents pending for its ground-breaking techniques for wireless virtual reality displays, which deliver 3D imagery to the displays wirelessly in near real time using millimeter wave radio transmissions. The technology for the Helmet Mounted Display was originated for training US Army Infantrymen and Law Enforcement officers, so that they could be completely untethered and have a more realistic experience. The integration of wireless VR with a pro football helmet makes it the only such visual system available for simulation training for football quarterbacks. About Serious Simulations, LLC: Serious Simulations LLC, an Orlando based Veteran Owned simulation business, designs immersive training systems using custom made hardware and software components for specific skill training needs, combined with motion tracking systems, wireless communications devices, wireless display technologies and commercial game engines. It produces wireless video technology and wireless head/helmet mounted displays (HMDs) with very high resolutions and wide fields of view. The industry-leading wireless HMDs, and wireless VR add-ons, are available separately or as components of Serious Simulations’ professional grade VR training systems for military, police, emergency responders, and professional grade entertainment experiences. 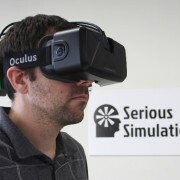 The company is a partner in the Open Source Virtual Reality (OSVR) network. For more information, visit our web site at www.serioussimulations.com . Inquiries: info@serioussimulations.com. About Sports VTS: Founded in 2016 and headquartered in Colorado Springs, CO, Sports Virtual Training Systems, Inc. (Sports VTS) is revolutionizing the world of sports training with its proprietary technology that creates Simulated Reality training experiences, allowing athletes to combine real world repetitions within the immersive environment of VR. QBSIM, the first product from Sports VTS, is the only simulation solution that allows a quarterback to train by passing a real football into virtual reality. The platform leverages sports science, big data, and state of the art technologies to help players maximize performance by learning faster through a focus on neuro-recognition of patterns and minimization of injury risk. About the UCF Business Incubation Program: The University of Central Florida Business Incubation Program is a community resource that provides early-stage companies with the tools, training and infrastructure to become financially stable, high growth/impact enterprises. Since 1999, this award-winning program has helped more than 390 local startup companies reach their potential faster by providing vital business development resources.